Kalderetang labahita is actually a fish caldereta and I think this is the easiest version of caldereta I’ve seen. Ingredients are also simple and easy to find and using caldereta mix to hasten the cooking process. Fish is also healthier compared to beef, pork or chicken so even if you overeat it’s not as worry some compared to eating red meat with fat. 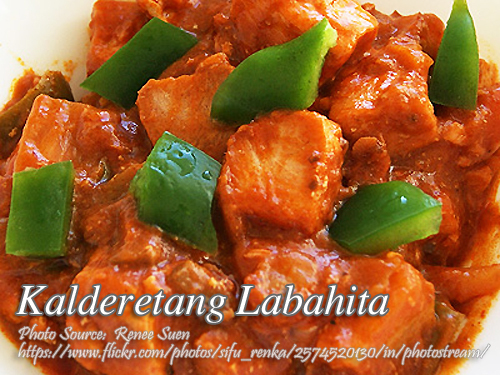 To cook kalderetang labahita; Sprinkle fish with calamansi juice and mix to coat the fish well. Dredge in flour and fry in hot oil until golden brown. Set aside. In a skillet heat oil and saute garlic and onion, then follow the potatoes and carrots. Stir fry until the potatoes and carrots are tender. Add water and simmer for a few minutes then pour the kaldereta mix. Season with salt then add bell peppers and simmer again for a few seconds. Add the fried fish and simmer again for a few minutes. To see the complete recipe, continue reading. Sprinkle fish with calamansi juice and mix to coat the fish well. Dredge in flour and fry in hot oil until golden brown. Set aside. In a skillet heat oil and saute garlic and onion, then follow the potatoes and carrots. Stir fry until the potatoes and carrots are tender. Add water and simmer for a few minutes then pour the kaldereta mix. Season with salt then add bell peppers and simmer again for a few seconds. Add the fried fish and simmer again for a few minutes. Serve hot. Hi Vicky, you can substitute it with lapu-lapu (grouper) or talakitok (jack/trevally) or any white flesh fish.